So when a local IT company went belly up and was selling their old hardware, including a late 90’s era IBM AS/400e Series, [Rik te Winkel] jumped at the chance to take this unique piece of computing history home. He knew it was something of a risk, as maintenance and repair tasks for these machines were intended to be done by IBM certified technicians rather than the DIYer, leaving little in the way of documentation or even replacement parts. But in the end it worked out, and best of all, he documented the successful process of dragging this 90’s behemoth into the blinding light of the twenty-first century for all the world to see. After getting the machine home and sitting through its thirty minute boot process, [Rik] was relieved to see the code 01 B N pop on the server’s display. This meant the system passed all the internal checks and was ready to go, he just had to figure out how to talk to the thing. Built to be a pure server, the machine didn’t offer any video output so he’d have to log into it over the network. [Rik] noted that there was no new DHCP entry in his router for the server, but of course that was hardly surprising as the machine would have certainly had a static IP when it was in use. So he shut the server down, plugged it directly into his laptop’s Ethernet port, and watched the output of Wireshark as it went through its arduous boot sequence. Eventually he started to pick up packets coming from the IP address 10.10.10.9, and he had his target. There are a few clients out there that allow you to remotely log into an AS/400, so he downloaded one and pointed it to the server’s IP. He was surprised to see the operating system was apparently in Dutch, but at least he was in. He tried a few common usernames and passwords, helped along by the fact that this OS from a somewhat more innocent era will actually tell you if you have the username right or wrong, and eventually managed to hack the Gibson with the classic admin/admin combo. So he was in, but now what? [Rik] decided that he couldn’t truly call this machine bested until he could pull up the Hackaday Retro Edition, so he started work on writing a program to let him pull down the page directly on the AS/400 in IBM’s proprietary Report Program Generator (RPG) programming language. You know, as one does. He didn’t quite feel up to writing a whole HTML parser, but he got as far as generating a HTTP GET request, downloading the page’s source, and opening it up as a local file. That’s good enough for us. Our very own [Al Williams] documented his adventures poking around an Internet-connected AS/400 machine, which might serve as a helpful primer if you ever find one of these delightfully oddball computers kicking around the local recycling center. The first computer I ever physically saw — I think — was an IBM System/3. You might not remember them. They were business computers for businesses that couldn’t justify a big mainframe. They were “midrange.” Nevermind that the thing probably had the memory and processing speed of the CPU inside my mouse. Time progressed and IBM moved on to the System/3x (for example, the System/32). Next up was the AS/400 and finally the IBM i, which is still in production. Here’s a secret, though, most of the code I’ve seen running on an IBM i dates back to at least the System/3 days and maybe even before that. If you are interested in history, or midrange computers (which are mainframe-like in their operation), you might want to actually play with a real machine. A quick glance at eBay tells me that you might be able to get something workable for about $1000. Maybe. That’s a bit much. What if you could get time on one for free? Turns out, you can. Head over to PUB400.com and register for an account. This won’t be instant — mine took a day or two. The system is for educational purposes, so be nice and don’t use it for commercial purposes. You get 150MB of storage (actually, some of the documentation says 250MB, and I have not tested it). While you are waiting for your account, you’ll need to grab a 5250 terminal emulator and adjust your thinking, unless you are a dyed-in-the-wool IBM guy. Even though the IBM i looks like an old 1970’s midrange, the hardware is quite modern with a 64-bit CPU (and the architecture can handle 128 bits) and well-known stability. However, the interface is, well, nostalgic. 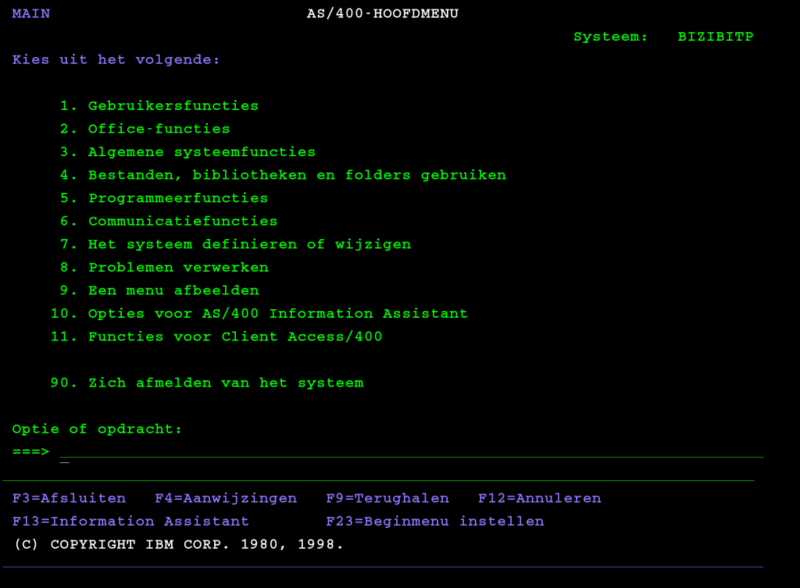 Depending on your host computer, there are several IBM 5250 terminal programs available. They recommend tn5250 or tn5250j which use Java. However, I installed Mochasoft’s emulator into my Chrome browser. It is a 30-day free trial, but I figure in 30 days I’ll be over it, anyway.